This is an original design done in red, red gold and gold 14's and 14 hexes. To see the same bag in purple delicas chick here. 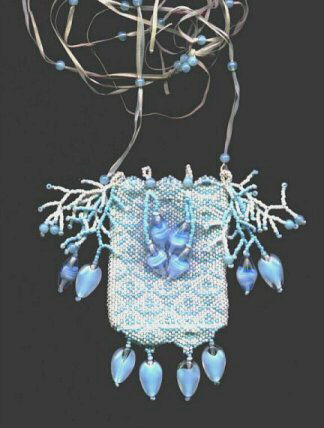 Thanks to all who voted for me, this bag is the Winner of the Jewelry Crafts Gallery #10, July/Augugt 1998! 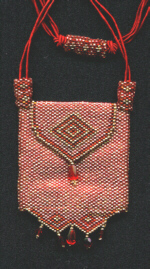 This is one of my versions of "Golden Elegance"
This is my first bag, done three years ago. 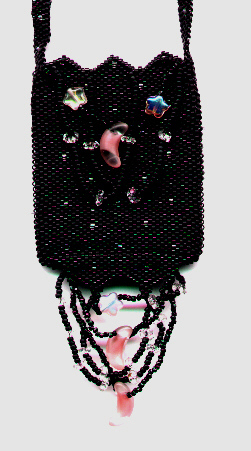 I was looking at my first Bead and Button and saw a graph of two drop peyote and thought I can do that and this is what I did. It's an original design. I call it "Me Melaque", after my favorite beach in Mexico. 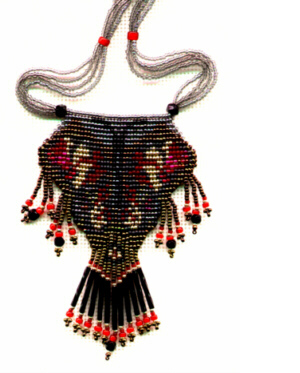 It is done in two drop peyote and embellished with shells I found on the beach, fresh water pearls and tiny starfish and coral branches . There is a dolphin bead as the clasp because I use to swim with the dolphins in the bay. 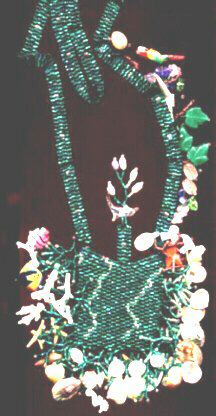 Up the strap are beads representing the plants and the birds. The one thing I left out is the sting ray that got me in my foot. But no hard feelings, I stepped on it and it didn't like that. And as any if you know who dive or snorkel they are friendly unless you step on them. And also they are sooo very pretty when they mate, it's like butterflies flying one over the other, hundreds of them all around. 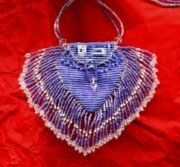 This is my second attempt at a peyote amulet bag, It's my version of Carol Wilcox Wells, Damask from "Beaded Amulet Purses". I didn't know what a delica was and I definitely wasn't up to doing a white on white bag yet, so I choose blue on white. 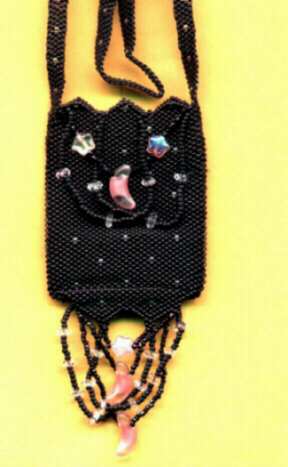 It's done in Japanese 14's and embellished with vintage beads. I still hadn't gotten ambitious enough to do much with straps yet, as you can see. Now by the time I did my third bag, I'd finally found delicas, but alas I still wasn't brave enough to do an original pattern. So I did Carol's Damask pattern again, this time in black on black, with a few clear delicas thrown in, embellished with crystals, stars and vintage moon beads. I call it Starry Starry Night and it still is my favorite. I've had lots of offers to buy it and lots of begging to recreate it, but for me it's going to stay one of a kind. 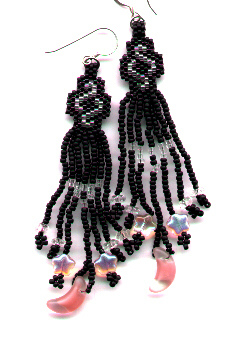 I made some earrings to go with it and the design is from Michael White Owl, they were my first attempt at flat peyote. So thank you Carol and Michael for the design and the inspiration to create two of my favorite works. The bag didn't scan very well so here are two views.